Well, I know it has already been said, but those of you who skipped the 21st AKA convention in Ocean Shores missed a pretty swell event. Management and organization was as smooth as ever, food was great, and the weather was more gracious than we deserved. One highlight for me was meeting Buggy Bison and seeing the huge smile on his face. Readers of rec.kites may recall that Bison wrote in challenging AKA and asking why he was required to pay a full registration if all he wanted was to buggy. It was a reasonable question, and I walked him through the dynamics of a convention — how it includes workshops, competition, demo and fun flying, banquets and meetings. We all specialize in some aspect of kiting, but we are also part of a larger, mutually-dependent kite community. The convention is our one best opportunity to bring the community together. For those interested in sport kite competition, the annual Rules Symposium was both positive and productive. Much discussion focused on merging the various rankings and circuits in the USA in order do that fliers don’t have to pick one or the other, or travel to multiple events to secure their position. There was also general approval of the international effort to compile a common rulebook, even if it meant compromises in how we Americans have traditionally run our events. The idea exchange was as positive and constructive as I have seen in seven years moderating the forum. Out on the field, if there was any complaint, it was that the beach was too big. Fliers were spread over half a mile with buggies at one end and the mass ascension field at the other. In between, competition arenas featured sport kites and kitemaking. I was privileged to staff the microphone through most of the annual auction and we brought in more than $22,000 in roughly three hours. 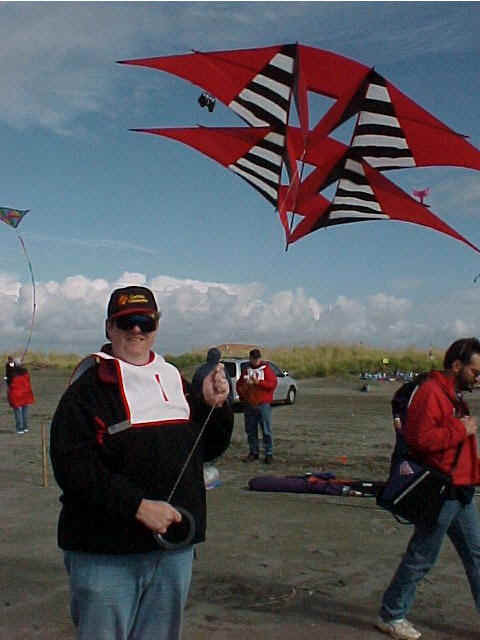 Credit goes to the Ft. Worden kitemakers that presented a five kite series that brought in more than a thousand dollars each ($5000 total), and the rec.kites arch which sold in several sections for about $1200. Saturday night, Susan found us places at the right table. To my right was Kevin Shannon. He spent more time on the stage than in his seat, parading back and forth an unprecedented six times for kitemaking awards including three 1sts, two 2nds, and a special achievement award from the judges. 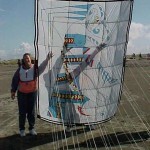 Across from me, Tanna Haynes received her second trophy as kitemaking Grand Champion. She and husband Glenn won three other awards as well. And to my left, Jon Burkhardt was named winner of the 1998 Steve Edeiken award, the highest honor AKA gives. Oh yes, and I got the rokkaku trophies. I should also point out that Jim Miller was awarded the Bob Ingraham trophy for service to the AKA. 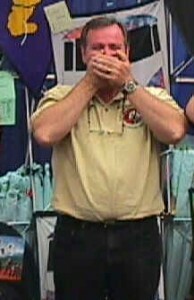 This was Jim’s final effort as convention manager after six successful gatherings. He has created a well-managed package along the way. Corey Jensen presented the award with one of the best speeches I have ever heard from him. The surprising news is the relatively low attendance at Ocean Shores. While past conventions in the area have numbered around 550, this one drew only 400 members. As a result, AKA remains financially challenged. They will finish the year in the black (barely), but low convention revenues and a continually declining membership mean further cuts in Association projects for the coming year. Sign up a friend and be part of the solution. Next year, AKA returns to the midwest for the first time since Chicago, 1988. The other major event this Fall was World Cup IX. During the precision heat alone, we saw winds of up to 18 mph, sun, drizzle, rain and then no wind at all. Teams could only wait and watch and be prepared to drag everything they could think of into the arena for last minute changes. Some flew with vents and screens; others struggled with wet ultralights. It was a typical Cup. AfterShock of Japan was declared the 1998 World Cup Team Champions. Second and third place went to Keops and LungTa (both of France) respectively. AfterShock’s win resulted from a flawless six kite routine to theme music from the movie Godzilla. Tight original maneuvers, intricate multiple kite weaves, and smooth use of the music combined to present the strongest ballet I have seen in years. It needed to be strong. After score adjustments, the Japanese finished Precision in seventh. They had a long way to come back. After finishing first in Precision, Keops flew to Broadway music in a routine reminiscent of retiring champions SkyDance. They finished third in Ballet. LungTa, in their fifth WC appearance, performed to original music composed specifically for the team. They edged out Keops in Ballet but a lower Precision score dropped them into third overall. Both French teams flew clean, well-timed ballets, but failed to generate the excitement or anticipation of the Japanese contingent. American readers will not be excited by the results. Chicago Fire, flying in their fourth Cup finished in 10th. Team Shanti stepped out of bounds and was disqualified in Precision. That zero score contributed to their last place finish overall. Generally, the Cup was well run on wide grassy fields. Uneven wind and sporadic rain hampered performances which were already stressed by lack of practice space. The huge crowds that usually turn out for Dieppe remained mostly around the single-line fields. Certainly, there were questions and controversy as we have often seen from the elite WC judging panel. 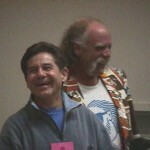 Prior to the gathering, there was debate about the use of new rules. Later the proposed changes were withdrawn. Precision was scored and results announced on Friday, but then changes made (and explained in a closed, fliers only meeting) on Sunday. But overall, it was as good a contest as we have seen in years. The real question is what to expect for World Cup X. 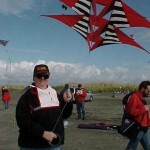 Owner Roger Holeman of Ocean Kites in Washington State has sold his store but retained the rights to the Cup. Will it be transferred later or will Roger continue to oversee this important international match? With the owner out of the kite business, will the organization receive the same enthusiasm? Will future Cups have a base in Long Beach as expected? Or most simply, where will we go for 1999? Rumors persist about a contest in South Africa, but as number nine came to a happy close, no news was available about where we go next. Editor’s Note: Congratulations to David for his fifth straight win as AKA Rokkaku Champion. This entry was posted in 1998, Issue 6 (Nov/Dec), KL Archive and tagged aka, convention.